Delivering high speed broadband services to Multi-Tenant Units (MTU) and Multi-Dwelling Units (MDU) is an exceptionally competitive market. Attempting to address this market with legacy network solutions can put a Carrier’s entire market strategy for this segment at risk. Positron Access Solutions’ next generation OSIRIS 1024-F Carrier Ethernet Optical Switch (CEOS) Platform establishes a new benchmark for serving high speed broadband services to the MTU and MDU market. The OSIRIS 1024-F CEOS leverages the heritage of the OSIRIS SONET Multi-Service Platform (MSP) while delivering simplified deployment, dramatic performance improvements and outstanding economics in an environmentally hardened package. Operational benefits are achieved through an architecture that integrates a comprehensive set of management and monitoring tools with state of the art non-blocking Ethernet switching core (128 Gbps). The OSIRIS 1024-F CEOS integrated NID functionality meets and reports Service Level Agreements (SLA). These features make the OSIRIS 1024-F a comprehensive solution to deliver Metro Ethernet Forum (MEF) Carrier 2.0 Ethernet (CE) services effectively and economically. OSIRIS 1024-F enables efficient and quick migration to Ethernet-based carrier access networks, simplifying the delivery of multiple services economically. Support for ITU G.8032v2 Ethernet Ring Protection enables redundant and resilient 10 GigE aggregation links that meet or exceed stringent Service level Agreements required to deliver MEF CE 2.0 services. E-Access support allows for the delivery of wholesale service to other carriers thus enabling alternate revenue streams. Space and power requirements are always expensive and challenging. OSIRIS 1024-F‘s low profile (1 RU) with integrated NIDs, significantly reduces the cost and challenges associated with installation and operations. Its four 10 GigE ports, 24 GigE ports and a fast nonblocking switch core, facilitate the delivery of high bandwidth Ethernet services to a variety of business and wholesale subscribers. When covering a campus of MDU & MTU, the OSIRIS 1024-F offers 10 GigE redundancy between each building and fully managed GigE ports to serve individual subscribers within the building. 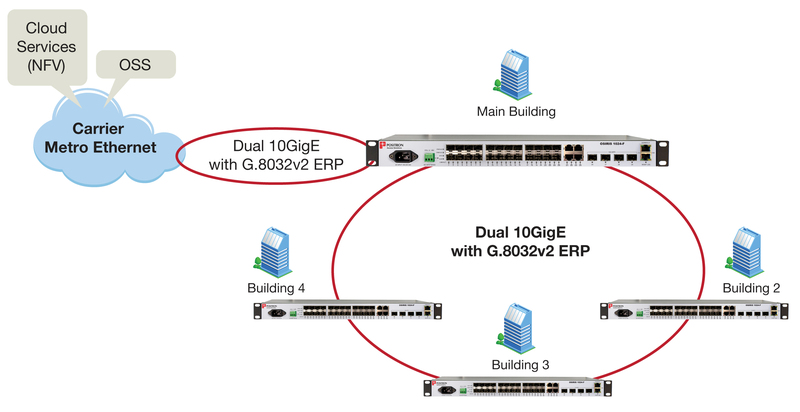 In addition the switch supports Link aggregation where GigE or 10 GigE ports can be grouped together to provide multiple Gigabits of Ethernet services to any subscriber. This makes the OSIRIS 1024-F ideal to meet current and future needs of bandwidth hungry users. The OSIRIS 1024-F is designed for carriers to quickly and profitably deliver ultra high bandwidth services. It builds on Positron Access Solutions extensive experience in delivering carrier grade solutions for the Central Office (CO) and the Outside Plant (OSP). With the OSIRIS 1024-F, you have access to state-of-theart Ethernet switching capabilities with fully featured NID functions on all ports in a highly integrated device. The OSIRIS 1024-F offers comprehensive Carrier Ethernet capabilities to facilitate installation, service turn-up, monitoring and provisioning of value-added services supported by the stringent SLA required by increasingly demanding customers. Whether delivering cloud services, video streaming or voice services or access to the Internet, it is essential to be able to have the necessary flexibility and extended features to cost efficiently deliver these services, address competitive pressure from other operators and increase the Average Revenue per User (ARPU). With Positron Access Solutions, we have your access network under control, from your Metro Ethernet core to the subscriber. Coverage for larger campus sites is robust with real-time redundancy for maximum uptime without additional devices. With the OSIRIS 1024-F CEOS flexible redundant transport and access functionality, providing resilient 10-Gigabit Ethernet coverage to Campus locations has never been easier. 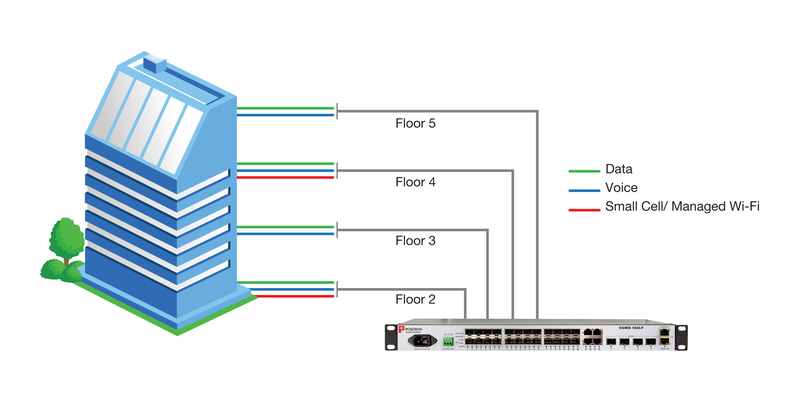 Leveraging the four (4) 10 GigE ports of the OSIRIS 1024-F, simply configure a redundant Ethernet ring toward the Carrier Ethernet core and a second redundant Ethernet ring to distribute the 10 Gigabit of bandwidth to each building across the campus. Once the Ethernet protected ring connectivity is established to each building across the campus, the 24 GigE ports can be leveraged to deliver value added services (e.g. data, voice, video, mobile coverage). Thanks to the advanced traffic shaping and policing of the OSIRIS 1024-F, each subscribers is guaranteed the services they sign for and you have peace of mind in knowing that the defined services for each subscriber are delivered with the assigned Quality of Service (QoS) at all times. This is exemplified below where the OSIRIS 1024-F delivers managed data, voice and small cell or managed Wi-Fi to different subscribers.